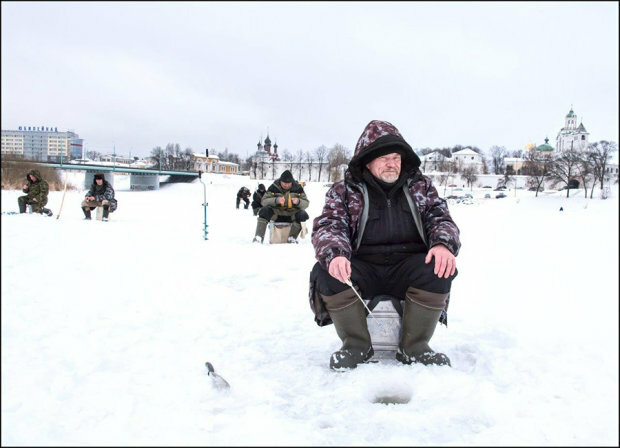 The exhibition "Exeter/Yaroslavl - A Photographic Essay of Two Cities"?currently at the RAMM (Royal Albert Memorial Museum) Cafe until 15th April 2018 is a joint project between Marija Lees LRPS, and a Russian photographer, Aleksei Lobanov fromYaroslavl (Russia). "The idea behind this project was that two photographers visit each other's city and capture their first impressions of the city, the region and its people from an outsider's perspective. Although Exeter and Yaroslavl have been twinned for 29 years with regular professional/business/friendship exchanges, most citizens of both cities still know little about the city and community they are twinned with. This project was an opportunity for me to show how photography can be used to build bridges and connect different and far-away communities and cultures. Although I enjoy and appreciate all genres of photography, my main photographic interest tends to be centred around people, with photo-journalism and street photography being my favourites. I was attracted to this project because I felt that there would be a strong story-telling element in it. Russia has always been a country of great mystery and appeal to me and I felt that for someone to get to know Russia, one really needs to go in the Winter as this harsh climate is a defining factor and so much part of the fabric of Russian society and their way of life. Having skied in -10 degrees in my earlier years, I thought I was familiar with the notion of cold weather but nothing prepared me for the biting cold of -27. The Russian Winter like an Ice Queen, is the true ruler of that land. It literally took my breath away. For me it was like a fairy tale, a true Winter wonderland - as though I had just stepped into the set of Dr Zhivago. It was breathtakingly beautiful, serene and majestic. Yaroslavl and its region is rich in heritage and history with so many truly magnificent churches and monasteries and it is quite clear why the city of Yaroslavl has been listed as a UNESCO World Heritage site. However, it was not just the buildings, no matter how beautiful they were, that were of interest to me. I wanted to capture the city that lives and breathes, the spirit of the city which means its people. In my photographs, I feel I have captured the sense of Place and People - to convey to the viewer the story of what it is like to be there in the Winter. I hope that this exhibition, already shown in Yaroslavl to much acclaim, will provide more insight into life in these two cities, their cultural heritage and the landscape of the surrounding regions."